Flower Children : The Little Cousins of the Field and Garden. Flower Children: The Little Cousins of the Field and Garden. 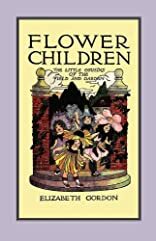 About ELIZABETH GORDON (Author) : ELIZABETH GORDON is a published author of children's books. Some of the published credits of ELIZABETH GORDON include Flower Children, Bird Children. About M. T. Ross (Illustrator) : M. T. Ross is a published illustrator of children's books. Some of the published credits of M. T. Ross include Flower Children, Bird Children.